OfficeLink360 - The easiest and most affordable to use Benefit/HR Administration solution designed for groups of all sizes. Retain, attract and grow your book of business. OfficeLink360 strengthens the brokers & client relationship. Introducing OfficeLink360, the easiest and most affordable to use Benefit/HR Administration solution designed for groups of all sizes to be used by both brokers and client to streamline the day to day Benefit/HR administration duties we all share. Most affordable Benefit/HR Administration software available. See an 80% reduction in broker/client benefit plan administration. Great solution for all of your clients - small, medium and large. Give your clients more added value for their benefit dollar. You or your client can access and execute all your Benefit/HR Administration duties from one single mobile dashboard. Competing in today’s benefit market is intense and competitive. Everyone is looking for ways to defend against the competition and at the same time trying to find that special 'something' to differentiate themselves, grow and protect their business. Until now, brokers who can afford technology solutions seem to have an unfair advantage in the marketplace. These technology solutions are expensive, hard to use and require you to change the way you run your business. In short, spending thousands of dollars and entering into multi-year software contracts for benefit software that you or your clients may or may NOT use is not an option for many brokers. OfficeLink360 doesn't change the way you run your benefit business. OfficeLink360 delivers a scalable, cost effective software solution for brokers who are looking to streamline their client's Benefit/HR administration workflows by adding just enough functionality without requiring huge changes in the way the broker or their clients currently run their business. Set up in minutes. Streamline your workflow. Step 1: Invite your clients to OfficeLink360 or let your clients know you have the technology! Invite your clients to LINK to their OfficeLink360 account, you created for them - letting them know you have the Benefit/HR admin software available if they want it. Step 2: Client set up – in minutes. If your clients wants OfficeLink360 Set up takes only minutes. Use the client & policy information you already have and enter it into OfficeLink360. At this point OfficeLink360 will provide you a dashboard view into all your clients, renewal & policy information, all in one place. To fully integrated the OfficeLink360 capabilities, you or your client can easily upload an employee excel OfficeLink360 template. 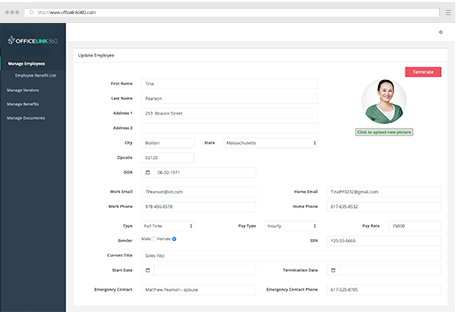 Once this is done, the OfficeLink360 platform will be fully operational and your client will finally have a single database that they can view and manage all their employee, HR and benefit functions. Step 3: Let OfficeLink360 work for you. Now that OfficeLink360 holds your client's benefit and account information, you can service your clients faster and do more each day. Your client will be amazed at how fast you can turn around and service requests such as: employee terminations and adds, Cobra letters, plan documents and the list goes on! No more searching through paper case files or going back to the office - everything you need to manage your client is available in OfficeLink360, 24/7. 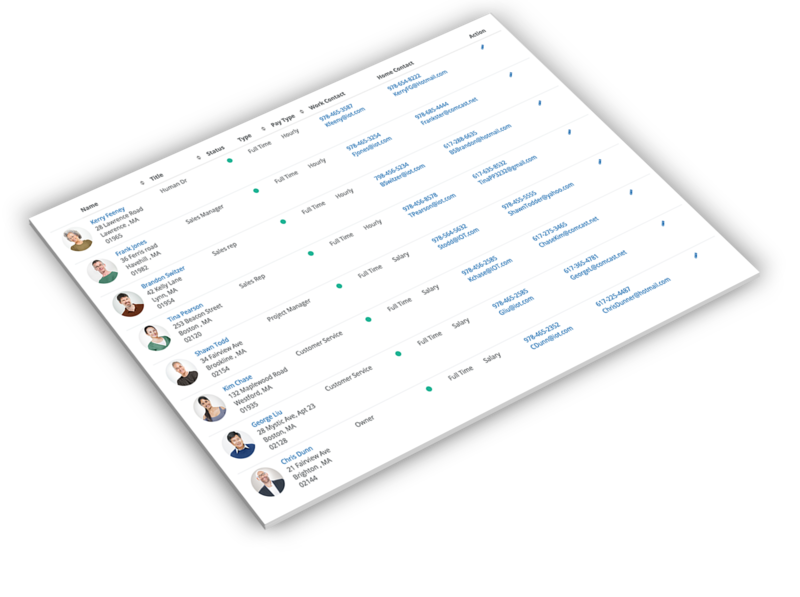 Your client has a single dashboard interface to manage their benefits too. Employer Notifications: Birthdays, Work Anniversaries etc. "OfficeLink360 has truly simplified the HR functions for my small business and reduced plan HR administration significantly." "I no longer need to scramble for documents. Now I can email documents to anyone in the company straight from my OfficeLink360 mobile application - it is a huge time saver!" "Not only have I been able to saved numerous accounts by giving my clients the OfficeLink360 Dashboard Technology but OfficeLink360 has huge benefits to my day to day operations as a broker." © Copyright 2015 Integrated Office Technologies, Inc.